For the first time Los Angeles, the birthplace of Skateboarding, will host this International skate film festival dedicated to the best films and the people behind them. 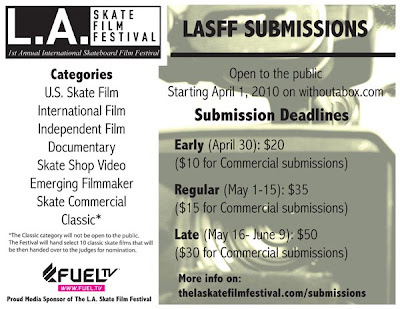 The L.A. Skate Film Festival will focus on eight featured categories including: U.S. Film, International Film, Independent Film, Documentary, Skate Shop Video, Emerging Filmmaker, Commercial and Classic. Selected submissions will be sent to a panel of judges including skateboarding legend C.R. Stecyk, SkateDaily.net co-founder Bryce Kanights, and French filmmaker Fred Mortagne. Top nominated films will be publicly screened in Los Angeles on August 31st and September 1st, 2010 at the Downtown Independent Theater followed by an awards ceremony on September 2nd, 2010. 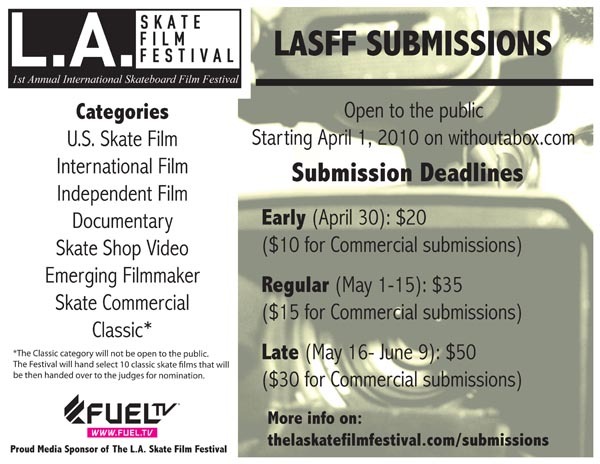 Fuel TV, the “Official TV/Network Partner”, will broadcast highlights of the Festival on the “Daily Habit” and the “Weekly Update.” For L.A. Skate Film Festival updates and information, please visit the official homepage at http://www.TheLASkateFilmFestival.com. Cute design with great detail i get much information from this site. i also wanna mention here some thing. Its about fashionable shoes. Which is Etnies shoes uk. All the new and latest design you got from this site. i love film Festival.Thanks For Sharing Information.